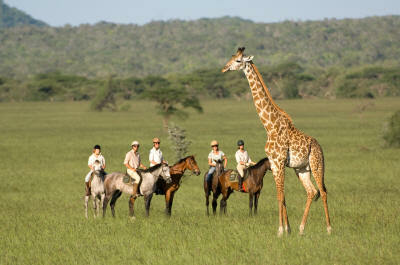 Some Horseback Safaris can be customized to match the exact requirements of clients. Some have set departure dates. Botswana, Kenya and South Africa are the most popular destinations. Riders can now experience the ultimate African adventure - exploring the vast unspoilt African wilderness on a horse riding safari. These horseback safaris in Africa allow you to experience African wildlife, scenery and culture at close quarters. Horse and rider become one with the environment - sharing the same sights, scents, sounds and excitement of the African wilderness. Our below horse riding safari adventures are of a highly personalized nature and maintain their own individual character in offering a personal insight combined with a commitment to and love for the areas in which they operate. The horseback safari packages in South Africa, Botswana and Kenya are all members of The African Horse Safari Association and represents the best horse safaris in Africa. The Association sets a standard of professionalism in equine care, guiding and accommodation, combining care for the client with unrivaled personal detail. Horses and tack of the best quality and traditional camping comfort of the highest standard are provided. By choosing one of our below horse riding safaris, you will be riding with some of the most experienced guides and operators in the horse safari field in Africa, whose depth of knowledge of their respective environments will enhance your African horse riding safari experience.